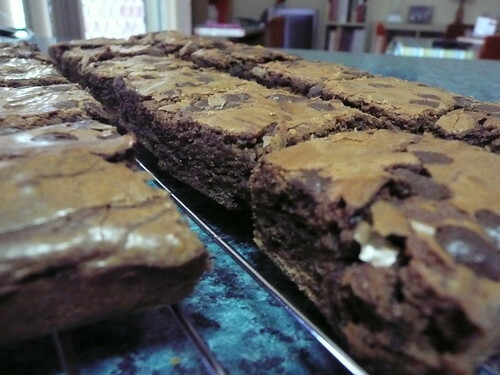 I made some Chocolate Brownies for Janet on the weekend..... the recipe is a hand written one I havein one of my recipe folders. It has no name on it, so I am not sure who it came from. But it is from someone who has neat writing and a red pen :-). 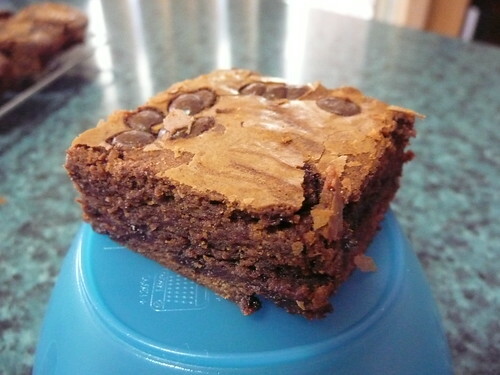 The original recipe is for Walnut Brownies. Obviously if you want them to be Walnut Brownies. add walnuts. Because these were for Janet, I used chocolate chips instead, since she is not a fan of crunchy nuts. melt butter in saucepan, stir in cocoa and sugar. Remove from heat and whisk in eggs. Stir in flour and add-in of your choice. Spread evenly into a slice tin. (I then sprinkled with some more choc chips). Bake in moderate oven for about 20 minutes. When cool, cut into squares of a size of your choosing.